Kostas Bassanos was born in Greece. He studied Sculpture at Accademia Clementina in Bologna (Italy) and MA Sculpture at Winchester School of Art (GB). He holds a PhD from University of Southampton (GB) and he is Asst. 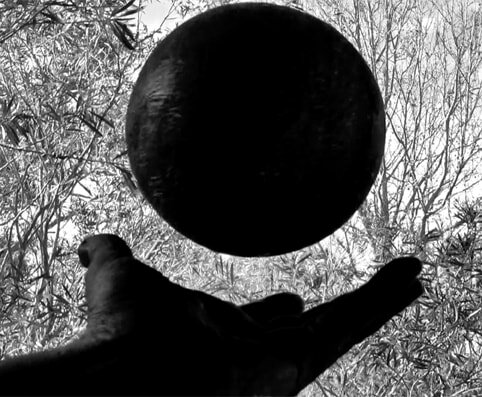 Professor in Sculpture at The School of Fine Arts of the University of Ioannina (GR). He lives and works in Athens. Recent exhibitions (selection): Multitudinous seas, Fondation Hippocrene, Paris, France; 7th Benjing Biennale, Cina; The Garden Sees, Megaron, Athens; Back to Basics: Text,ENIA Gallery, Peireaus; Epigramma, Nitra Gallery, Athens; (Im)material Gestures, Fondazione Sandretto Re Rebaudengo, Torino, Italy; Still (the) Barbarians, Eva International Irish Biennial,, Limerick, Ireland; Landscape Revisited, Elika Gallery, Athens; Overseas, ACG Gallery, Athens, Tender is the Night;CAN Gallery, Athens; Prophetia, Fundacio Joan Miro, Barcelona, Spain; Pre-Text,, Ileana Tounta Contemporary Art Centre, Athens; Mehr als schein / Shining through, Zone D, Athens; Silence, Ileana Tounta Contemporary Art Centre, Athens; Monodrome, 3rd Athens Biennial, Athens. ​(a cockroach crash)triggers a "pause", which is represented in the printed book as "- - - - - -" and "folds" narration into itself, as it happens at the very beginning and at the end of the book. The way that narration folds and unfolds within overlapped sentences (every chapter starts with the last sentence of the previous chapter) gives a rhythm to the narration, which is interrupted by the cockroach event. In the work the rhythm is represented by the gridas an open ended structure and the event by the creased sheets of paper. "For this work I have used the title of C. L book The Passion according to G. H in order to contextualise the work and make a direct reference to it." Images courtesy of the artist, Stephen Little. ​Top: The Harbinger Suite: CURSE, 2018. Single Channel video, Duration: 06:00. Stephen Little is a contemporary artist whose practice explores alternatives to traditional models and orthodoxies commonly employed in the classification of painting. Instead of relying on pictorial traditions or painterly conventions to dictate outcomes Little highlights painting’s potential by reworking it through other media. Having side stepped traditional materials and methodologies Little draws on everyday objects, materials and associations to deliberate on painting today. Little received his Bachelor of Visual Arts from Nepean College of Advanced Education, a Graduate Diploma of Visual Arts and a Master of Visual Arts from Sydney College of the Arts, University of Sydney, and a Research Doctorate (PhD) from Goldsmiths College, University of London. Little is currently Head of Painting at Australia’s National Art School in Sydney. 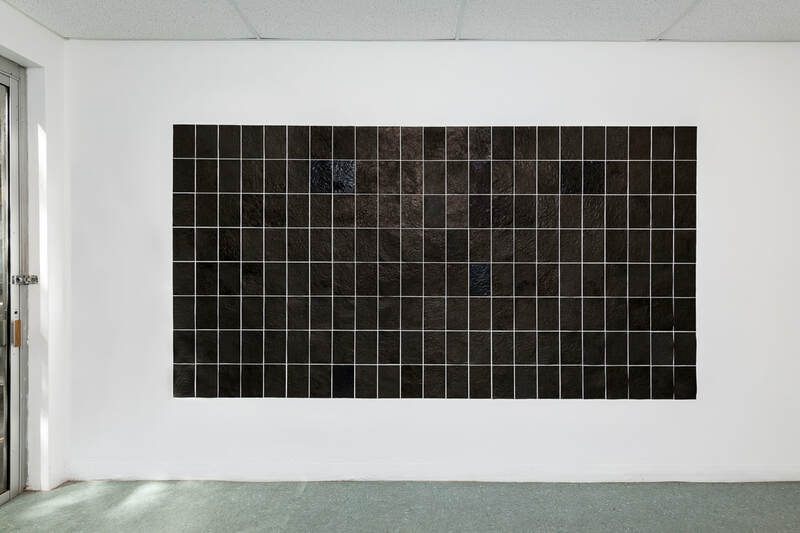 ​ Stephen Little is represented by Kronenberg Mais Wright Artists Projects. As an ongoing project The Harbinger Suite addresses issues of identity, pluralism and a need for social/cultural tolerance. It challenges rationalism, science and normalized systems of belief within the current post-factual cultural malaise. We live in a time when the merits of data are politicized and put to the service of other agendas or ideologies. This work revisits older systems of belief. It incorporates the esoteric, mythology, superstition, magic, symbolism and ritual. Having grown up in Ireland, flags, banners and drums have historically demarcated territories, borders, clans, cultural and social values, and ideological beliefs. They continue to do so today. 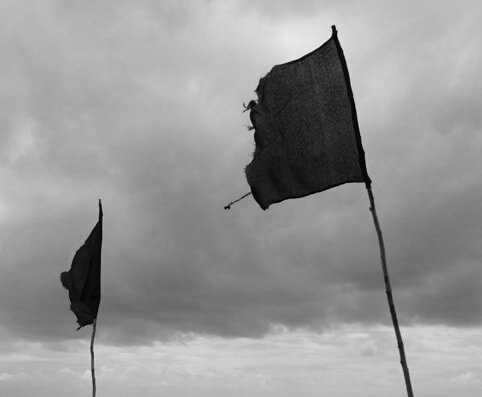 The black flags in CURSE represent the absence of a flag – the dissolution of boundaries. They oppose the notion of different groups or nation states while symbolising defiance and opposition to subordination and surrender, and are intended as cathartic banners for those without a voice. Hannah McKellar is a Sydney based artist, who graduated from the National Art School in 2014 with a BFA in Printmaking. In 2017 McKellar was a finalist in the Small Things Art Prize and received Highly Commended in the Cooks River Small Sculpture Prize. Her practice currently explores the theme of self, through the nostalgic use of embroidery and fabrics. Using materials and processes in an attempt to slow down and dissect anxieties, her practice is both cathartic and confronting. McKellar draws data from memories and experiences, beginning all artworks with diary entries and analysis. 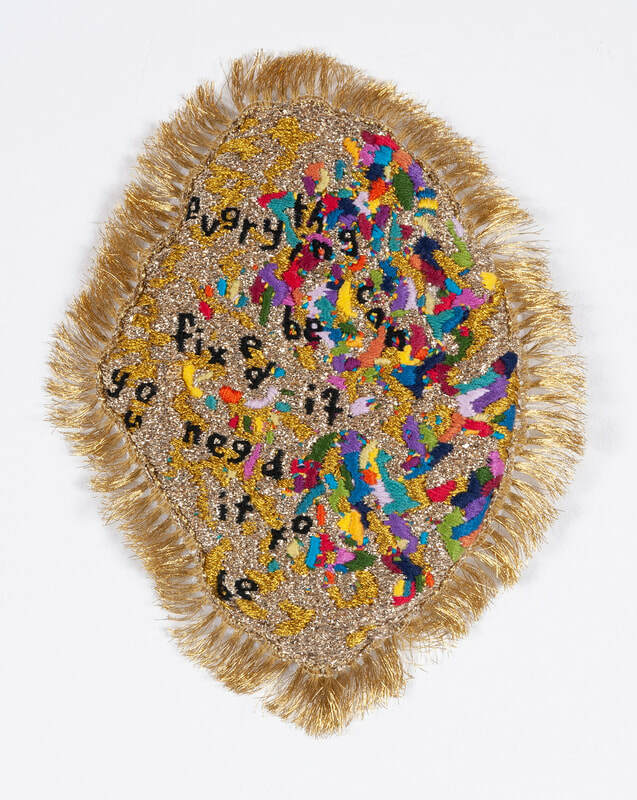 Incorporating text within her embroideries, enforces viewers to delve into her psyche and empathise with her conflicts. 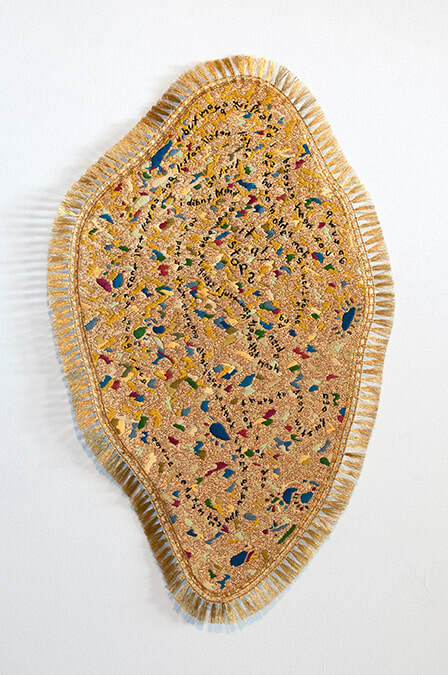 Coated with vibrancy and golden thread, the artworks in the ‘Shields’ series suggest strength, control and protection. However, each object is a façade; an externalization of the artists psyche. Using time consuming processes and nostalgic materials, each shield was created as a form of personal therapy and escapism. Diary entries and mind-maps are translated into a tactile form using the embroidery process. The overworked thread creates a rigid and distended structure, by its own nature, forming a restrained protective barrier. Audiences are simultaneously invited and deterred by the artworks, enticing them to examine and make connections to their own experiences. Process and creation are used as a cleansing, each Shield turning into a token of emotional relief. The passion according to G.H.is an extremely relevant and important exhibition for me to be involved in. Humans by nature are emotionally erratic: it is necessary for us to be open and vulnerable in order to proceed. Using language throughout my practice has enabled critical analysis of thoughts, and the ability to mentally slow down and therapeutically process. ‘It all stops’ is the newest edition to the ’Shields’ series, created in response to the exhibition rationale. Likewise, to ‘The Passion’, it was produced after a time of difficulty and tracks experiential crises. Turning words upside down and flipping letters backwards leaves a linguistic maze for the viewer to decode, just like Lispector attempts to say the unsayable. Images courtesy of the artist, Hannah McKellar. Top: Shield: It All Stops, 2019. Linen, cotton, natural and acrylic fibres, 100 cm x 60 cm.